Along side I am doing my AAs. 2 chapters or so per day. I did have fun with the secondaries. My old editor used to accuse me of loving my secondaries more. Not really, it is just you can have fun with them. And then I need to read over TPE and make a few more changes. Plus it is lovely out. I am so Not a List person. Even with grocery shopping, I tend to write a list and then forget to look at it. Eventually everything works out. This week is busy -- my editor is on holiday and I have promised her three things for her return -- revisions on the script that is taking forever (just about done), revisions on the Roman Undone (to be done) and the AAs/copy edits (in the process of being done. Still doing the revisions but the story is getting better. Some stories are like that. I had done something and it sucked the likfe out of the story, but a bit of judicous cutting , the life and tension are back. Sometimes it is better to withhold information until the point it will have the most impact. It will be finished in the next couple of days. Then I have more revisions to do on the Roman Undone. In theory they should be quick. So he is now set for the summer! And my migraine monster headache of yesterday has vanished. Way back in 1994/5 when the internet was first beginning to take off, modems speeds were slow and my children very young, my mother's partner wrote a paper for a class he was taking. It was all about how in the future, the internet would be used as a video link so people could keep in touch. He got a low mark and was laughed at. The paper was called the Grandeer Connection after the pet name my children had given my mother. For a number of reasons, we have never used video links, even though they have become common place. (Among other things we both hate having our picture taken!) That is until now. Today, I waved my eldest goodbye as he starts his first leg of his 16 month adventure which includes spending time at my sister's and doing an exchange programme at the University of Illinois for the academic year. He's 19 now and will be nearly 21 when I next see him in the flesh again. I am very excited for him -- after all I did the same sort of thing 25 years ago and know how thrilling it is and how much it change your life -- but I will miss him. One of the things he has done is to ensure we have a webcam and are connected to skype. It will be good to see him. But I rather suspect that he will want to see Tess, Hardy, Chile and the kittens far more than seeing the rest of us! Did I mention that I hate having my picture taken? Anyway, my mother's partner was right all those years ago -- the internet does provide a great way to keep in touch with those people who are far away. I have been busy doing an online workshop on Using Historical Detail to Create a Vivid World this week. It is proving interesting as I am having to put my thoughts on paper. I am also nearing the end of my revisions. I think angels will sing when this book finally gets accepted. I do know that it is a far stronger romance now. I have gone back to basics and reread Writing Romance for Dummies. It is funny how much stands out to me now that I have had so many books published since the last time I read it. One key phrase about sexual tension -- make it obvious. I might know the chemistry and the desire is there, but does the reader? I am going back and layering it in. The devil is really in the detail! Compromising Miss Milton is Michelle Styles’ most exciting book yet! In her stunning new novel for Mills and Boon, award-winning author Michelle Styles deftly combines superb characterization, passionate romance, nail-biting suspense, exciting adventure and heartwarming pathos in an irresistible new story that will keep readers on the edge of their seats. Cataromance has an interview with me up to celebrate both Compromising Miss Milton's release in the UK and An Impulsive Debutante in the US. My eldest arrived home from his first year of university yesterday. It is good to have the house back up to its full complement. Lucy Pevensie is looking in a spell book for a spell she desperately needs. The spell, it turns out, is in the form of a story, a really amazing story that Lucy can't stop reading. It's so good that she tries to go back and reread it, but finds the (magical) pages only turn in one direction. Worst of all, the story is erasing itself from her brain even as she reads it, so that by the time she gets to the end she can't remember it at all. But it was such a good story that from that day on, whenever she reads something that she enjoys, it's only because it in some way reminded her of that one perfect, lost story. It can be argued that it sums up childhood reading -- finding books that really spoke to you. So I'm going to do a meme and hope others will join in. (Kate Hardy?, Donna Alward?, Nell Dixon?, India Grey? Julie Cohen? Nicola Cornick?) Anyone! Just add a comment that you have done it and I will be delighted to go and see. 1. The High King by Lloyd Alexander -- read when I was about 9 and I wanted to be there. And then I made the mistake of confiding to a friend who just did not understand. The dedication at the beginning of the book says it all btw. But knowing what I know now about Celtic mythology, I worry would I enjoy it as much? 2. Ozma of Oz by L Frank Baum --I still love the idea of the people being changed into ornaments, the princess who has different heads and the Gnome King. 3. The Horse and His Boy by CS Lewis -- it just is. Adventure romance. 4. Johnny Tremain by Ester Forbes -- first huge literary crush on Rab. 6. Paddington the Bear by Michael Bond -- because it introduced me to marmalade and other English goodness. The ever so lovely India Grey asked and I have held off doing this until today as today is a special anniversary for me. Five years ago I went to the bookshop to pick up a book my husband had ordered. And had just arrived home. Five years ago the phone rang. I answered it. 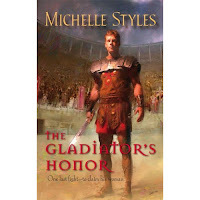 Five years ago, my editor Who Is Right On Such Matters informed that she wanted to buy The Gladiator's Honour. Five years ago today, I became a HMB author. After the phone call – buy champagne. Didn't trust myself to drive so I walked or rather floated on air. Let various people know without seeming like a jabbering idiot. Finishing the ms that became A Noble Captive. To do now – major revisions for my current Victorian. 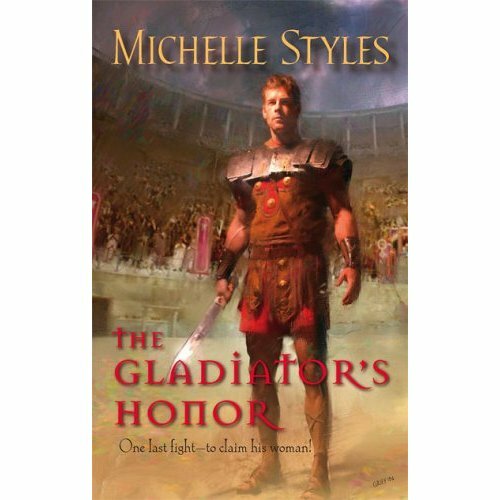 Then minor revisions for my Roman Undone. Get ready for the RWA Nationals in July, Get ready for my eldest coming home tomorrow from university. Support my daughter who has a History A level today (which I think she will ace! the three bedroom bungalow we moved to just before my sister was born and where I spent my formative years. One of the chores was to bag the ivy that grew as a hedge separating us from the park. I hated it. the Grade 2 listed late Georgian terrace house that was the first house my husband and I bought – one bedroom but oh what a period pieces were left. Travel to places I have always wanted to go. Buy a horse for my daughter. Keep writing because I enjoy it. Live modestly but well. Because there is more to life than money. But money can help make you comfortable. I think just about everyone else has done this one. If anyone wants to do it. Go ahead. And thanks to Kate Hardy for her tweaking of the topics! My cp Donna Alward wrote a wonderful piece using an iceskating metaphor. It is well worth reading, as it does capture some of the reasons why certain books are outstanding and others are...well...just there. Go read it. It might sparks some ideas about creating magic. I am busy working away on my revisions and trying to capture some of the magic. I do think I know where I went wrong in the beginning -- namely I forgot the focus needed to be so heavily on the main couple and as I was starting what I had planned to be a trilogy, I wanted to do some other things. And guess what it didn't work. One always hopes the new way is a better way. Last evening I finished Neurosurgeon and Mum! Kate Hardy's latest. And in traditional Kate Hardy style, it grabbed me by the heart strings and refused to let go. I loved how it wasn't a traditional medical but possibly closer to Kate's MH but the medical detail was also expertly woven in. She also created a lovely community and really brought her world to life. I love the fact that her heroine was the high flying consultant and the hero -- the locum g.p. who shows her why life is for living. Reading it, I had loads of light bulb moments, including realising a few places in my current ms where I had skated over things and had totally forgotten the sexual tension etc. Anyway, I stayed up a bit late to finish it. And can recommend it to anyone who wants a feel good read. Now when is Kate going to do a single title small town women's fiction as she would be so good at it? In the back of the book, there was a shout out for M&B's biggest talent search ever. All will be revealled on http://www.romanceisnotdead.com/ in due course. But they are looking for a new star and readers are going to be asked to help. All exciting stuff! It is another gorgeous day but I'm busy working on my revisions. Sometimes, I suspect that it is much easier just simply to throw the whole thing out and start again. However, I'm stubborn and it is FINALLY starting to get better. 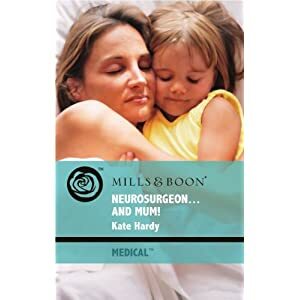 The wonderful Kate Hardy sent me a copy of her latest -- Neurosurgeon and Mum! and after reading the first page, I had a few light bulb moments about why my heroine behaves the way she does. (BTW the book is typical Kate Hardy heart warming. ) It does go back to the Mother/daughter relationship. (I can hear Donna laughing as I have kept saying things like this about HER heroine, but obviously wasn't taking my own advice.). All I have to keep thinking is engaging believable characters...this can be done. Today is the ever so lovely India Grey's significant birthday. Hooray for India! And hooray that she is writing more books! I will be appearing on the newish Silk and Shadows blog tomorrow. There is a signed copy of An Impulsive Debutante up for grabs. My revisions are being done. My editor was right about the book (editors generally are) but I am working away. Unlike some authors, I do not mind admitting that at times I have to sweat and slave over my work. Writing can be tough. It is supposed to be challenging as the author does have to pour emotion in. 99% persperation, 1% inspiration. Yesterday, as part of my Orlando prep, I bought an Acer netbook. It was a good deal and should be more than adequate for my needs. Basically I want to be able to communicate with outside world...and if an agent asks to see my single title paranormal, I want to be able to send it. I was surprised how light they are. As my dd pointed out, the basic wordpad programme is fine as I can save and then do a cut and paste thing if I want. In theory, it make doing the chunks easier.